What do you do when you nature hands you the gift of beautifully ripe summer tomatoes? Why, you get out your canner and jars and go to work. Canning is a simple, but exacting process that is easily mastered. And opening a jar of Home Canned Tomatoes in the middle of winter is like opening a ray of summer sunshine. I’m sure it’s weird, but excessive amounts of gorgeous summer produce get me so excited. I immediately start making plans about how to preserve it and what to do with it later on. If I have peaches, they usually wind up as preserves with some also being frozen for use in cobblers later in the year. Same with berries and other fruits. Peas and butterbeans are always blanched, packaged, and frozen. But when I have an abundance of tomatoes, I almost always can them. I just think canning is the best way to capture that fresh summer taste. Plus, they look so nice on my pantry shelves. If you have never canned before, or if it has been a while since your last time canning, please review the current guidelines. You always want to make sure that you handle canned goods correctly. Improperly canned foods can really be disastrous. I wrote a post about correct canning techniques a few years ago that you mind find helpful. The first step in this or any canning session is to prepare your jars, lids, and rings and to start your canner full of water heating. Wash the jars, lids, and rings in hot soapy water. Place the lids in a small pan with enough hot water to cover them and place it on the lowest heat setting on your stove. Put the clean jars in your canner rack and let them come up to the boil along with the water in the canner. Then you can get on with preparing the tomatoes. Wash the tomatoes well, then peel and core them. 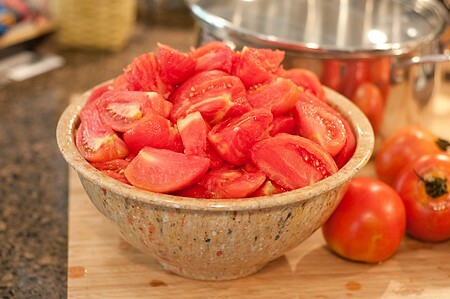 You can leave your tomatoes whole or cut them into halves or quarters. I did quarters this time. When all the tomatoes are prepped and ready to go, start filling your jars. 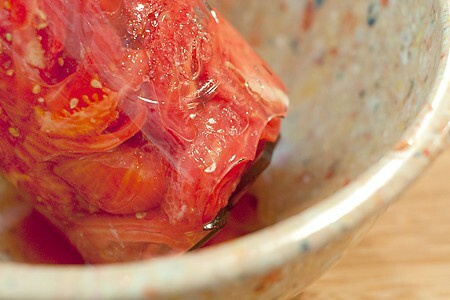 The method I use for canning tomatoes is the “raw packed in their own juice” method. The way I proceed is this. Lift the canner rack with the jars in it and hook it over the sides of the canner so that it remains elevated. Remove one jar at a time from the rack and drain the water from the jar back into the canner. Place the hot jar on a folded dish towel. Add the salt and lemon juice to the jar. Just a note about this step, in case you’re interested. Modern varieties of tomatoes are not acidic enough to be safely canned using a water bath method and that is why the lemon juice is required. You can faintly taste it in the finished product, but adding a tablespoon or so of sugar will offset that taste. Additionally, it’s recommended to use the bottled lemon juice from the grocery store instead of squeezing fresh lemons. The pH of the bottled juice is controlled at a specific level and fresh lemon juice may or may not have the necessary pH to maintain the safety of your canned tomatoes. Pickling salt is used because it doesn’t have any additives that could cloud the liquid in the jars. It’s just pure salt. Way more than you wanted to know about canning tomatoes. Am I right? Fill the jar half to three-fourths full with tomatoes and then gently press on the tomatoes to release the juice and fill all the space between the tomatoes. Continue filling and gently pressing until the contents of the jar are within 1/2 inch of the top rim. Wipe the rim with a wet paper towel. Apply the lid and ring and sit the jar back on the elevated rack in the canner. Repeat the process until all jars are filled. Now gently lower the rack with the filled jars into the boiling water in the canner. There must be enough water in the canner to completely cover the tops of the jars by one inch. Begin timing when the water in the canner returns to the boil. I just have to share this photo with you. I know all you seasoned canners will be able to sympathize with me. In all my years of canning, I had never had a jar break. Until now. I got in a hurry and took a shortcut (I’m not telling what I did) that let my jars cool down too much. When I put this one in the canner, I heard that distinctive “pop” and immediately knew that it had broken. If this happens to you, don’t even think about trying to save the contents. There are likely to be teensy-tiny shards of glass in there that you’d never find. Just let it go and learn your lesson like I did! Process both pints and quarts 85 minutes. Longer processing times are required for higher altitudes (see recipe below). At the end of the processing time, turn off the heat under the canner and allow the jars to sit in the water for 10 minutes. Carefully remove the jars from the canner and sit them on a folded kitchen towel. Allow the jars to cool completely before moving them (at least overnight). Check to make sure seals are complete. Store in a dark, cool area. Procedure for canning the abundance of ripe summer tomatoes at home. Prepare standard canning jars and lids according to manufacturer’s directions. Peel and core tomatoes. Leave whole or cut into halves or quarters. When all tomatoes are ready, prepare one jar at a time, keeping the other jars hot while you work. 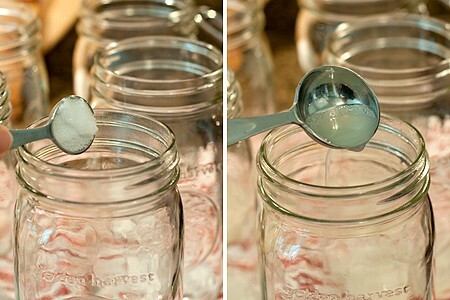 Add 2 tablespoons lemon juice and 1 teaspoon salt to each quart jar (half the amount for pints). 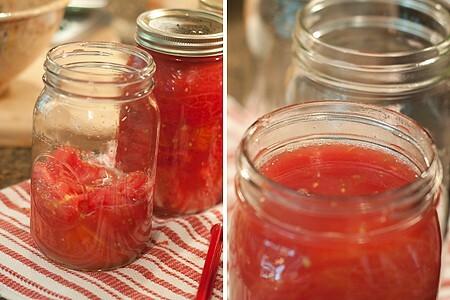 Pack tomatoes into jars, pressing gently on tomatoes until the juice fills the spaces between tomatoes. Leave 1/2 inch headspace. Wipe rims of jars and apply two-piece canning caps. Process in a boiling water bath 85 minutes for both quarts and pints. Beautiful tomatoes! I agree with you about opening a jar of those beauties in the middle of the winter–ah, the aroma of summer. After all the work, I love to hear the pops and pings of the jars sealing as they cool. The very best thing about canning is the pinging of the jar lids, isn’t it? I just love that! I’m new to all this wonderful canning experience. Quick question: I’m under doctor’s orders to keep salt out of my diet. Is salt absolutely needed when canning? Is there a healthy substitute? Thank you for your input, Lana. Hi Grace. Yes, it is safe to omit the salt when home canning tomatoes. It’s there for taste only. I hope you enjoy canning as much as I do, Aly. I’ve been canning for at least thirty years and I never get tired of it! I wish my pantry was full of your canned tomatoes! They look magnificent! Oh these are amazing sounding…I need to get on the canning circuit…I’m envious. Fabulous information!! I hve only frozen my roasted tomatoes, haven’t canned yet. I have several plants outside with fruit on them, but don’t think they’ll make it to the canning stage LOL I have a feeling they’ll be gobbled up fresh! I have definitely saved this though, great explanation. And thanks for the info on the lemon juice too! I almost never have enough tomatoes to can from my few plants I grow each year. I just happened to be at my mother’s house at the height of tomato season on one of the local truck farms where you can get boxes and boxes full for next to nothing. So, of course, I just had to put these up for the winter! Ohhh, I’m jealous of your tomatoes. I’ve never canned tomatoes but you sure put the itch in my pants! 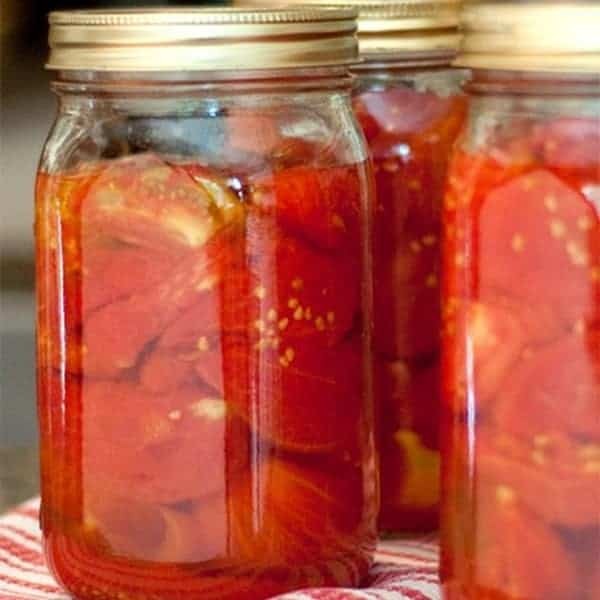 I have plans to do a jalapeno peach jam next week for Christmas presents but I might have to add some tomatoes to the canning project…now that I know how to do fresh tomatoes! Oh, Megan, that jalapeno peach jam sounds really wonderful! Will you be posting the recipe? Please, please, pretty please?? Okay, I really need to get over my irrational fear of canning. Before I know it, my garden is going to be bursting with tomatoes and I would love to store some away for winter. Thanks for this post and your previous canning post, Lana. oh my goodness – just imagine how tasty those will be in the dead of winter. Summer in a jar! Oh, yes! A couple of years ago we had an ice storm in January – very unusual for Georgia – and what do think I put on the stove? A huge pot of vegetable soup with loads of canned summer tomatoes. It was the perfect thing to enjoy on those cold house-bound days! After reading posts like this I immediately want to go out and start a garden! However, I realize that it simply isn’t part of my DNA .. which means I need to get busy and find a local gardener to befriend, LOL!! Great info. on canning Lana – it really isn’t all that scary if you understand the procedure!! Right, Nancy! Just like any kitchen technique, it’s all about educating yourself and practice. Granted, canning is more precise than most kitchen pursuits, but it’s important to follow accepted guidelines to ensure that your finished product is safe for self storage. What happens if forget to put the salt in a canner full of tomatoe juice. Just the one jar, thank goodness! In all the years I’ve been canning that was my first broken jar. It just about broke my heart! You just reminded me that I need to make some more salsa, too. It just beats the store bought stuff all the way around! Oh my goodness Lana–they are gorgeous tomatoes! A farm market near my parents home had boxes of them for cheap the other day, but I wasn’t sure if I was brave enough to try canning them yet. But you’ve once again made it seem so simple–and all of my other attempts at the canning recipes you suggest have turned out beautifully! So excited to try this next week! This is so great – I definitely need to take the time to do this, especially with so much tomato greatness available this time of year. Great post! Thanks, Cassie! I love opening a jar of summer tomatoes in the middle of winter. Best tomato soup ever! I have always loved how your pantry looks at the end of summer. All of the beautiful jars of lovingly preserved items, with the colors of summer…. it just invites happy times later in the year. I just took a canning class this week to learn about making jam. I am so excited to can veggies too! Great post. I remember my grandma canning tomatoes and lining her pantry with jars and jars and jars of beautiful food. I’m pinning this for when the kids are a little older because I MUST do this! We had a class on home canning, and the teacher(home economist) said that the savest way to can tomatoes is to use a pressure canner at 13# pressure for our elevation. Don’t know what your opinion is of this. Just throwing it out for comments. Hi Doris. Both pressure canning and water bath canning with added acid from lemon juice are USDA approved methods. Neither is really any safer than other as long as correct procedure is followed. I never canned before but this year I made pear jam, strawberry jam and peach/apricot jam. I even have a garden but so far I only have green tomatoes – I started late. I also planted a lot of herbs and yesterday I chopped up some parsley and some basil, put them in some ice cube trays with oil and froze them. I am retired now and enjoying this time more than I can say. I am going to can tomatoes but it will be for sauce. Thanks for the instructions. I’m so glad I could help you with instructions. Sounds like you’re really doing great with the canning and gardening. You will need to use an exact measurement of real lemon juice. You can’t guess at the amount in a canning recipe. That can affect both the pH and taste of the finished product. Fresh lemons are available in every grocery store’s produce section. There’s also a product called RealLemon that is not a concentrate – just straight lemon juice.